On May 17 2011, WTR announced the winners of its fifth Industry Awards at an exclusive ceremony in San Francisco’s Asian Art Museum. The awards are designed to recognise the vital work carried out by in-house trademark counsel, and identify the teams and individuals that are performing their functions to the highest possible standards. Over the following pages we speak to the winners and explain why they were judged to be leading examples of industry best practice. New generic top-level domains are here, but what brand considerations come into play when deciding whether to apply for a proprietary gTLD and what should you take from your existing protection and enforcement strategies? The Internet Corporation for Assigned Names and Numbers (ICANN) has published a report proposing that a full-scale review of the Uniform Dispute Resolution Policy (UDRP) is not recommended. The Office for Harmonisation in the Internal Market (OHIM) has unveiled a new organisational structure. Following an extensive consultation period, OHIM’s new strategic plan sets out three overall objectives: to build a strong, vibrant organisation; to improve quality and optimise the timeline of operations; and to promote convergence of practice. To achieve this, six lines of action have been identified, including the establishment of the I P Academy and knowledge repository, the improvement and broadening of quality, and the development of the European network. The Court of Justice of the European Union (ECJ) has clarified the territorial scope of injunctions and the coercive measures used to enforce such injunctions for infringement a Community trademark (CTstating that “the scope of the prohibition against further infringement or threatened infringement of a Community trademark, issued by a Community trademark court… extends, as a rule, to the en tire area of the European Union”. The Supreme Court of Canada has clarified that trademark rights acquired through use in one geographic area of the country may be relied upon to prevent the registration of a later similar trademark, even if the later mark is used in a different part of the coun try. 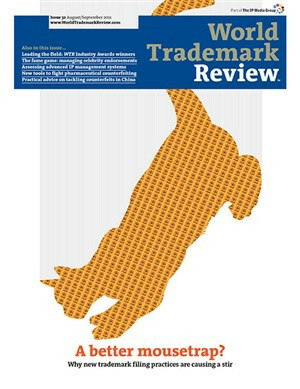 The US system for protection and registration of non-traditional trademarks is liberal and pragmatic. Practitioners should consider its flexibility and broad protection. Rights holders can confidently embrace non-traditional trademarks in their overall IP strategy for the US market. According to the law on traditional trademarks, words, logos and wording in special characters enable consumers to distinguish sources of goods and services. However, what about particular colours and sounds that have the ability to identify goods and services belonging to a particular business source? A trademark’s principal function is to distinguish the products of one entity from those of another. In order for a sign to serve this purpose, it must be perceived by the public as a sign of origin and not as a mere description, general statement or advertisement. The Trademark Law 1998 (significantly amended in 2010) follows the principles of the EU First Trademarks Directive (89/104/EEC). Thus, in Romania, a ‘trademark’ is defined as any sign that is capable of being represented graphically and distinguishing the products of one entity from those of others. Sophisticated businesses rely on more than simple words and logos to identify their products and services. Unique product and packaging shapes, slogans, colours, jingles, endorsement by personalities and even smells can be used by businesses to identify their products or services. In order to make a product or service more attractive or distinguishable, non-traditional marks are often used in modern marketing strategies. However, such use may result in a lack of adequate protection in some jurisdictions. Now that business is conducted on a global scale due to technological advances such as the Internet, manufacturers and service providers face pressure not only from the competition, but also because consumers are more demanding of new characteristic elements when deciding what to buy.